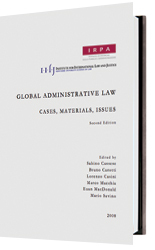 This book, developed by the Istituto di Ricerche sulla Pubblica Amministrazione (IRPA) in Rome in conjunction with the IILJ at NYU, seeks to analyze global administrative law through the elaboration and examination of a number of different cases and case studies. The architecture of its contents mirrors the characteristics of this new field, with sections on the emergence of global standards; on the new, complex forms of governance; on global principles for national administrative procedures; on due process; on judicial globalization; on the enforcement of global decisions; on overlapping and conflicting jurisdiction; and on the key field of global security. While the structure appears similar to that followed in the first edition, published in 2006, this new edition makes some important changes. Three sections have been removed, while nine new ones have been added. Most importantly, however, each of the forty-one sections has been considerably extended, and now they all follow the same basic schema: each has a section on the relevant background; a list of materials and sources (with hyperlinks wherever possible); an analysis of the example in question; and a discussion of the various issues to which it gives rise, enabling each author to flag some basic theoretical problems, and to highlight the relations between the different topics examined in the book. Each section concludes with list of recommended further reading, relating specifically to the topic with which it dealt. Lastly, a general bibliography provides an overview of the most relevant works on global legal issues, and particularly global administrative law, divided into twelve different categories.